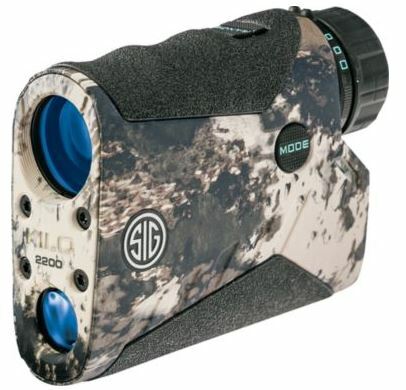 SIG Sauer® KILO2200LRH Rangefinder Lightwave DSP technology for ranging out to two miles HyperScan technology delivers four range updates per second Advanced OLED display with small center aiming circle RangeLock reports the last range result Expect more from your rangefinder. With revolutionary Lightwave DSP™ technology, SIG Sauer's KIL02200LRH Rangefinder has one of the fastest and longest-distance rangefinding engines available that's capable of ranging out to two miles. HyperScan™ technology delivers four range updates per second for precise yardage calculation. Advanced OLED display for ranging accuracy at extreme distances. RangeLock™ reports the last range result when ranging distant targets. Compact, magnesium housing with binocular-style eyecups and diopter adjustment ensures waterproof, fogproof performance and comfortable use. Line of Sight or Angle Modified range displayed with angle of incline or decline. Sleek one-handed design with lanyard attachment point for convenient, easy access. Maximum range is 3,400 yds. for reflective targets, 1,300 yds. for deer and 1,600 yds. for trees. Covered by SIG Sauer's Infinite Guarantee™ and electronics limited warranty. Cabela's Exclusive LRH (Long Range Hunter) model. Cancer and Reproductive Harm- www.P65Warnings.ca.gov.